Hi3 Solutions STANDARDS CONFORMANCE VALIDATOR (SCV) is a comprehensive suite of application services that validates compliance with health care information exchange standard specifications and conformance with related implementation guides and profiles. Effective, meaningful health information exchange requires that all parties involved adhere to predetermined transaction formats, usage constraints, and encoding rules. SCV provides the capability to compare the data content of information exchange transactions to existing HIE standards and guidelines and validates compliance and conformance to those specifications. 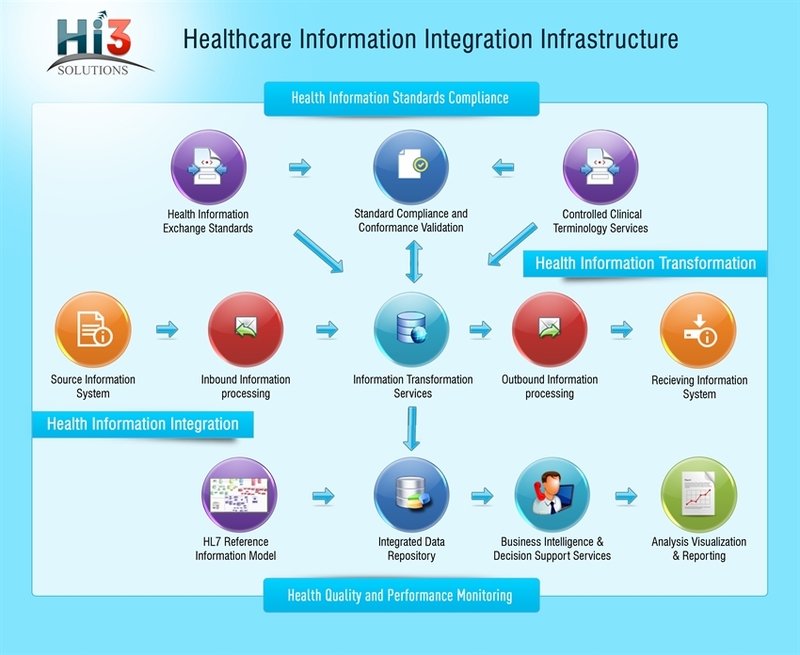 Hi3 Solutions HEALTH INFORMATION INTEGRATOR (HII) is a comprehensive suite of application and database suite that facilitate the transformation of data structures, translation of clinical terminologies, and integration of health information. Despite the existence of a wide spectrum of health information exchange standards and implementation profiles, it is still necessary to transform standard data structures to and from alternatively defined structures and value sets and to normalize transaction data content for inclusion in integrated data repositories. HII provides a set of data transformation services and a comprehensive integrated data repository that facilitates standards- driven data exchange and integration. Hi3 Solutions HEALTH CARE QUALITY MONITOR (HQM) is a comprehensive suite of data warehousing and business intelligence solutions geared specifically toward monitoring quality and performance in health care in accordance with established measurement standards. Establishing evidence-based best practices in health care and reducing the total cost of health care delivery is the ultimate goal for countless national and regional health programs, provider organizations, and health care professional societies. HQM provides the technical infrastructure and data mining, analysis, and visualization tools required to support adoption and realization of an in-depth health care quality and performance measurement program. Copyright © 2013 Hi3 Solutions | All rights reserved.